The Appalachian Trail is reputed to be a busy place, with hordes of hikers and backpackers. Maybe so during spring, summer and fall, but during the winter months much of the Trail is just the place for solitude and, with spring foliage still in the future, great views. I was reminded of this in early March when I did a short backpack on the AT east of Newport, Tennessee, from Highway 208/Allen Gap to Camp Creek Bald. As I was preparing to lift my backpack at the trailhead, two cars pulled up and a fellow asked if I could move my car so his car would also fit in the narrow parking area. I obliged, figuring I would probably have company on the trail and for sure at the trail shelter. Instead, he and his wife were shuttling their cars and he was going to hike the opposite way from me, and a lot farther, starting at Devil Fork Gap to the north, about 20 miles. It was already after 1pm and he had a long drive and over 8 miles to hike, but there's always someone who hikes faster and farther than you. The couple were the last humans I would see for the hiking part of the weekend. The first 4.9 miles to Little Laurel Shelter are relatively easy, generally uphill but nothing terribly hard (unlike the following mile). Ridgetop hiking, with views into Tennessee and North Carolina. The occasional house or road, and one spot in the distance where a landowner has created his own little National Forest inholding horror spot, eroding roads, acres of bare dirt, nondescript and ugly buildings, all on a steep hillside. The wonderful AT corridor thankfully usually keeps those developments at a distance. Winter was still much in evidence and only some green grass and the reddish tint of redbud blossoms provided evidence of the coming spring. I, of course, used the AT Conference Guide Book. These books are generally truly valuable information sources but sometimes they are frustratingly brief and tunnel (ie AT) visioned as they focus only on the AT corridor. At 1.0 miles from Allen Gap the TN--NC Guide states simply: "At sag, cross old woods road, and bear right (Ahead, gravel road from left can be seen ascending ridge)." Of course you wonder where the gravel road comes from and goes, is it a logging road, or what? But what's really missed is a reference to a chance to see a bit of pioneer history just 100 yards off the trail. Often when we hike the southern mountains, there is evidence of old homesteads; Ray Payne of the Harvey Broome Group is especially good at spotting them. Anything from a few foundation rocks to an old chimney and a few scattered artifacts, the remnants of long ago settlers. On this hike you can see not just the scattered remains, but the house itself, still standing on a steep knoll below the AT, a piece of history that somehow didn't rot and erode over the years. Actually the house may have been built in this century but to all appearances it is a replica of the past. And it isn't in mint condition either, but is still standing. An authentic one room log cabin, logs with mud chinking and what may be relatively recent improvements, a tin roof and planks placed over the chinking which would help preserve the mud. Above the one room is a sleeping loft, and the entire cabin is pretty messy with evidence of both old (antique bottles) and more recent (a USDA free food distribution box) occupation. Must have been short people, the ceiling was less than six foot and the support logs were even lower, about 5'5". A single mud chinked rock chimney provided heat; it still stands but with a two foot hole near the bottom. A rotting issue of a 1932 National Geographic Society Magazine indicates someone was using the house at that time; articles included the awarding of a Special Medial by the Society to Amelia Earhart for her completion earlier that year of the first flight over the Atlantic by a woman.. Irises, grass, weeds, and kudzu surround the cabin. Below the cabin two small creeks join, and a spring flows into one of them. 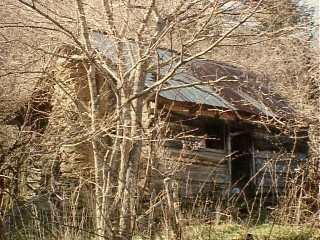 Behind the house, uphill, several old outbuildings, one certainly a barn, lie in various states of decay and disrepair, and a collapsed building lies below the cabin. Interesting to speculate about the people who came and lived in this then very, very remote place, a beautiful location but with difficult access. Why and when did they come here? Why and when did they leave? With time one could research some of our Southern Appalachian history here, but I had miles to go. The Trail continued gradually upward along a succession of ridges, finally to the Little Laurel Appalachian Trail Shelter. Here I left my gear and continued up the one long mile to the summit of Camp Creek Bald (which is no longer a bald). A short distance, but it is one of those trail sections for which the AT is famous, pretty much straight up the steep ridge, but much easier without the camping gear. The mountaintop is a monument to the communications/electronic age, and probably mostly the cellular telephone. Start with a simple, rustic fire tower on the very top. Then add eight or so communications towers, futuristic looking, and the summit begins to look like a science fiction outpost. Thankfully they've limited it to this mountain, leaving miles of real mountaintops in the distance. I climbed as high on the fire tower steps as was possible; the observation deck itself if blocked off with barbed wire. On the topmost steps I sat and looked around in the late afternoon. A cloudless sky allowed forever type views, over 50 miles which is as good as it gets in the southeast, looking west out over the Tennessee Valley to the Clinch Mountains beyond and east across peak after peak of the blue-gray Southern Appalachians. My thoughts as I looked out over all this country: "Thank God for public lands and the US Forest Service." This in spite of some recent terrible decisions by the USFS to clearcut some of our better unprotected natural areas. Everywhere I looked at private lands, there was development, and often overdevelopment, like the eyesore I saw coming in. In the Tennessee Valley below there was nothing but houses, roads, buildings, and a few small groves of trees here and there. On the other hand, around me and to the north, east, and south, the public land was obvious, ridge after ridge of grey forests marching to the horizons. Back at Little Laurel Shelter I looked through the Shelter's log book and confirmed that few people pass this way in the winter. Maybe 10 people had stayed at the Shelter during the winter months. I tent camped on a knoll above the Shelter, where the views of the setting sun were perfect and the morning sun would warm up the campsite. Just enough clouds in the sky for a gloriously private sunset viewing. Then a short nap in the tent as darkness descended and a jet black sky punctuated with dots of light replaced the day. Temperatures dropped into the 40's and a small fire made a cozy spot in the darkness for dinner. I tried, and once again regretted, a commercially prepared dinner of vegetarian chili; the commercial dinners somehow never match backpack dinners which my wife Barbara and I prepare, usually on our dehydrator. I ended up dumping the whole thing on the fire and eating some of my lunch food. In the tent I read a recent "Men's Journal" article entitled "Escape From Kashmir." And regretted it. The story is about several trekers in the Kashmir region of India, an area where the English drew an arbitrary line to separate India and Pakistan when they withdrew. Unfortunately many Muslims were left on the Hindu Indian side, and non-stop guerrilla warfare ensued over the years. Several trekers were captured in 1995 by a guerrilla group; the women and guides were set free, the men taken into the high mountains. One escaped, one was decapitated, and the fate of the others over one year later is unknown, but probably not good. I wasn't exactly scared after reading the article, but for awhile couldn't get to sleep for thinking about them and what I would have done in the same situation (Once I learned months later that two Germans were killed by guerrillas in their sleeping bags at a campsite in Peruvian Andes a few weeks after myself and several others camped there; even more scary was that later, after we climbed a mountain. I camped by myself only a little farther away). Sunday morning dawned clear and warm, no sign of the predicted rain storm. But gradually the clouds arrived and I hustled, after sleeping late, to fix an oatmeal breakfast and break camp. Made it back to the car in time for the rainy weather prediction to prove totally false, only blue sky and sun overhead. I arrived in just under twenty-four hours from setting out and headed for my first choice after a day or weeks in the wilderness, spicy Mexican food (in the Newport area that can only mean the Front Porch Restaurant in Cosby). Postscript: On a subsequent weekend Barbara and I drove back to the Bald Ridge Mountains and finally found the cabin near the end of a rough but passable dirt road. The road actually ends on a knoll above the cabin (and above the AT) at a cemetery that is also worth exploring. Graves dated back to 1912 although the most recent burial was in 1996. Populated mainly with Sheltons and Chandlers, generations of them. The grave of James Rufus Chandler and Lois Dixson Chandler reflects that she was 13 and he was 19 when their first son was born. The son lived only one year and many other graves reflected short life spans. As we drove on to Hot Springs a historical marker indicated the location of the Shelton Massacre, when Confederate troops killed a number of local Shelton family members who were suspected of being Union sympathizers. Were some of the victims related to the people who were buried in the cemetery, or were some of the victims buried there? Lots of historical questions to wonder about. If you're interested in taking a look at the cabin and cemetery, drive southeast from Greenville on Asheville Highway, Hwy 70 South. Just .2 mile before Allen Gap and the TN-NC state line, turn left at signs for Viking Mountain Greenhouses and Viking Mountain Road. Go .8 mile on the paved Viking Mountain Road and turn right on an unpaved road at signs for the Greenhouses (which are visible from the turn) and Viking Mountain Lane. Follow Viking Mountain Lane .5 mile on a gravel road up a wet valley, and you'll soon drive below the cabin; .2 mile further the road dead ends at the cemetery.